The Year Of The Goat Is Here ! Spring Festival, widely known as Chinese New Year worldwide, is the most important traditional festival, and the most important celebration for families in China. It is an official public holiday, during which most Chinese have 8 days off work. Chinese New Year 2015 begins on Thursday 19 February, and end on 5 March. It is day one of the month one of the Chinese lunar calendar, and its date usually falls in in January or February, and varies from year to year (always somewhere in the period January 21 to February 20). The Chinese lunar calendar is associated with the Chinese zodiac, which has 12 animal signs: rat, ox, tiger, rabbit, dragon, snake, horse, goat, monkey, Rooster, dog, and pig. Each animal represents a year in a 12-year cycle, beginning on Chinese New Year’s Day. 2015 is the year of the goat. 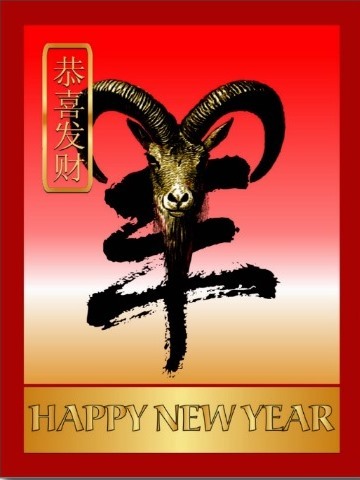 2015 is furthermore a year of the “Wood Goat”, according to Chinese Five Element (Earthly Branch) Theory. A “Wood Goat” year occurs once every 60 years. Most organisations in China will be off work from Wednesday, February 18 (New Year’s Eve) to Tuesday, February 24 (the 6th day of Chinese New Year). The offices of Continental HK too, will remain closed between 19 Feb 2015 to 23 Feb 2015. Only skeletal staff will be available during the holidays to answer your queries, and you may experience a slowdown in reverts to queries and reservations during this period. The operations teams handling the guests, however, will be working as usual. We do regret any inconvenience that you may face during this period. We would also like to take this opportunity to thank you for all your support in the year gone by, and look forward to your support in the coming year as well. Wishing you a very Happy New Year Of The Goat !